Technically speaking, Purpose is not considered a Motive per se. We would argue that It's a sustained life of motivation and have included it as a foundation of motivation. One of the most potent examples of Purpose is Viktor Frankl's horrific experiences in four Nazi Concentration camps. His purpose was what kept him motivated. I'll do my best to describe Purpose and how to discover it. Purpose is our addition to the Self-Determination Theory. Richard M. Ryan and Edward L. Deci, authors of the book Self-Determination Theory: Basic Psychological Needs in Motivation, Development, and Wellness postulate that three psychological needs are necessary for humans to be motivated to grow and thrive. Humans thrive when internal motivation is nurtured. We suggest that a fourth factor needs to be added: Purpose. We'll explore what Purpose means and how to discover it. The fourth factor of motivation that we added is this mysterious thing called Purpose. The idea of a Calling or a Purpose irritates a lot of people. I've had many people complain to me that they don't have a Purpose, or can't find a Purpose, or express objections that not everybody has a Purpose. I believe why these people find Purpose irritating is because of a deep longing to have Purpose and not discovering it. There are many words and definitions of Purpose. Let's explore a few. 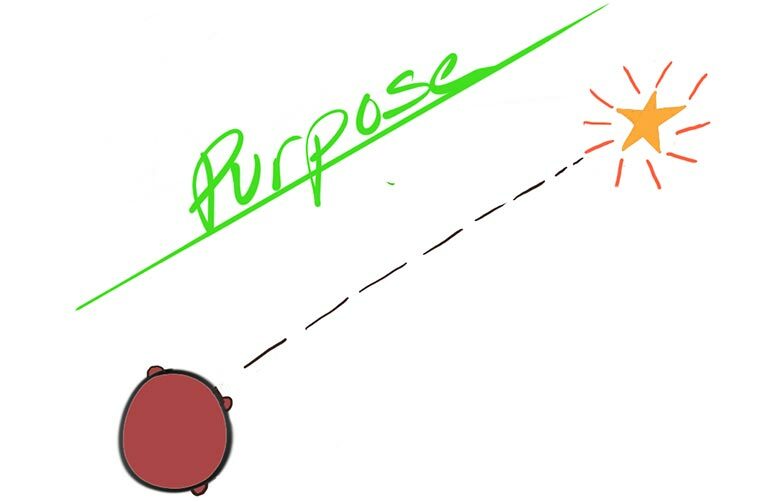 Synonyms for Purpose are North Star, WHY, Cause, etc. Simon Sinek, author of Start With Why, says: “Your WHY is the purpose, cause or belief that inspires you”. Stephen Cope, author of Yoga and the Quest for the True Self, writes: “All human beings have the innate capacity and longing to mature to full aliveness.” When you are living a life of Purpose, you feel alive. Aaron Antonovsky, founder of the Sense of Coherence Theory and author of Unraveling the Mystery of Health, was trying to answer the question: “What are the origins of health?” He believed that Physical Health could be promoted by three factors, one of which is Meaningfullness. Meaningfullness is defined as how much one feels that life makes sense, and challenges are worthy of commitment. That's what a life of Purpose feels like; your life makes sense. Purpose – as we interpret it – is "internal autonomous energy that increases motivation.” No one can put pressure on you to have a Purpose and if they tried, it would only deplete your motivation to act. Purpose is not like a coat you put on; it's something deep within yourself, it's a path to accomplish something greater than yourself. Why is “aliveness” as described by Stephen Cope so profound? I recently asked myself “when have I felt the most alive?” I was amazed that it was when I was living CAMP (Connection, Autonomy, Mastery, and Purpose). When I'm Connected to other people, I'm energized by their ideas and worldviews. I'm not alone in my head. When I feel Autonomous, I don't feel pressure. I feel naturally motivated to act. I'm happy when I'm gaining a little more Mastery, a bit more wisdom, and more skill. I feel an internal inspirational pull to get closer to my Purpose and live it every day. It's inspiring to me to be motivated towards something greater than myself. When you understand your motives, you accept yourself. This is how you find out what makes you tick. Your motivation is the number one driver for everything. Many people are disconnected from a sense of self, that's why when searching for a new job, they often base their criteria on the external factors like money or a job title. How can you discover your Purpose? I think a good start is Simon Sinek's online WHY Discovery Course. It's affordable and very well done. When was a time when you were in a total state of flow, a state of complete absorption? What was it about that activity that was so absorbing? What was a project that you were involved in that had your focused attention? What activities do you love to do? What is it about those activities that you find so compelling? What did you want to do/become when you were in your teenage years? If you had a purpose, cause, or belief, what do you think that might be? What do you care about genuinely? And why? What is your favorite movie? Who is your favorite character in that movie? And why? What are the specific qualities in that character that you admire? Who inspires your (living or dead)? What are the qualities of those people? One of the transcendent examples of Purpose. One of the most compelling actual stories of a person living a life of Purpose is Viktor Frankl. Dr. Frankl had a profound, guiding Purpose which gave his life meaning in the most unlikely of places. He believed “that love is the ultimate and the highest goal to which man can aspire. The salvation of man is through love and in love”. His mental attitude, guidance, and inspiration was the cause for many men to choose not to take their own lives. Dr. Frankl believed that people are driven by a “striving to find meaning in one's life,” and it's because of this sense of meaning or Purpose that people are capable of overcoming unfathomable painful experiences. When Dr. Frankl uses the word “striving," this is precisely what we are doing – whether we know it or not. We are striving to live our motives to feel a sense of Purpose and feel alive. Read his famous book – whether we know it or not. We are striving to live our motives to feel a sense of Purpose and feel alive. Read his famous book Man's Search for Meaning and it will change your worldview forever. Questions: If you know it or tried to guess, what do you consider your life Purpose? How would you – in a small, doable way – create a better world for generations to come? You can leave your answers in the comments below.